Luxury 3 bedroom private villa with parking behind locked gates. April Rum and Lemon Festivals, May flower festival, every sat in June world firework championships set to music, many other festivals and events all year see Madeira event websites.. .
Large heated private swimming pool on its own terrace for your use only. Furnished to a high standard throughout. Located in a quiet and pleasant area near the town of Ribeira Brava. Centrally placed to explore the island. Villa and all 3 bedrooms have sea and mountain views. Games room with soft play area and Gym, your use only. Laundry room, washing machine and tumble dryer. Local shops restaurants 5-10 mins walk away. Close to local Amenities/Activities/Beach/Pursuits: Local shops, supermarkets, banks/cash machines, sports facilities restaurants cafes bars all 5 mins by car. AL licenced villa to meet the Portuguese Holiday rental standard for your peace of mind. Central position makes it ideally suited for exploring the island by car or bus. Events (Festivals, fireworks etc. All Year Round. June every Sat World fireworks championships). english, french, german, spanish, portuguese, russian, italian, dutch, swedish, greek, czech, danish, norwegian, polish, hungarian, arabic, finnish, turkish, mandarin, e-mail unless english please. The family bathroom with a large walk in shower (with room for all the family). All bathrooms are fully tiled with built in cabinets with mirrors, lighting, shaving points and towel rails. The family bathroom has a hairdryer. There are various electrical heaters throughout the villa. All bed linen and towels provided. Extra pillows. Lighter or heavier duvets available. Ask our representative. Large laundry room. Washing Machine, Tumble Dryer, cloths pegs, ironing board iron, and cleaning items. Villa has its own driveway with gate. Internet is via WiFi A dongal is also available if connection required at any time at most places on the island. Towels provided for 2 weeks use. Beach towels available. Exercise machines. Cross trainer, bike. WiFi gives full house cover accessable by our phones. Very large living room with dining area. Two large leather settees, with cushions and throws. Large grand granite staircase with chandelier. Art deco Artwork. Full stove and oven available. Filter coffee maker with filter papers. Balance, butter dish, measures etc. Large flat screen TV Multiple HDMI connections compatable with most common TV support systems. Your Netflix account will work but not Amazon prime or Firesticks unless you have EU wide cover. 5.1 surround sound DVD plays CD's CD player with ipod/iphone dock. Phillips 5.1 Surround sound DVD player. Collection of books in book shelves of sideboard. Guide books and maps, adventure, war, mystery, Sci-fi, fantasy, love. There are also some books in French, German. Playing Cards and other games, darts, tabletennis table, basket ball hoop. Toys and books for children softplay, cuddly animals etc i the games room. Garden with Tropical plants, Bird of Paradise (different sizes species) Yucca, Tree ferns, Flowering plants, Palms etc. Balcony on two upper Bedrooms facing sea and mountain view with table and chairs in teak. There are many boat trips available on the island. Veranda on upper terrace opens out from Living area via large patio doors. Three large terraces, with solid plastic sun loungers, teak dining table and chairs, dining area open via patio doors from the kitchen. Two golf courses and and new one at Ponto da Pargo opening 2013. Large heated private pool for your use only. Welcome pack - There will be essentials in the house on arrival, water, coffee, tea, sugar,bread, biscuits, milk in the fridge and provisions to make a small meal. Outside Outdoor dining table and chairs are available for 6 people with plastic tableware and large parasol provided. Full outdoor lighting on all terraces. Accessibility The outside of the villa is built on three terraces. There are approximately 8 steps down to the pool terrace and a further 6 steps down to the lower pool terrace. Both with large sitting areas for sunbathing. There are approximately six steps down from the road while walking to the front door or you can use the sloped driveway. Internally there is a wide two tier staircase to the bedrooms. This is indeed a luxury villa with everything you need. Family aged 2 to 60 loved it! So much more than home from home, with marble floors downstairs and wooden floors upstairs. The beds were comfortable, the kitchen well equipped and the pool perfect. As the villa is in the hills we did have some cloud and wind on a few evenings in our 2weeks. Shame about the noisy dogs in the area. Overall, we had an amazing holiday. Thank you for your nice review. When there is pin drop silence you can hear all sorts of things you do not usually hear and the bark is designed to travel a long way. I remember once while camping an irritating buzz noise came in short repeated succession's we tracked it down to a large grey slug eating a dandelion. Luxurious, very spacious, nicely furnished nice pool area. Highly recommend. Everything you need. Renting this property you need a vehicle although taxi and bus service is available. Be aware the driveway is very steep. 300m down the road is Mr Pizza. Rosa and Peter are very friendly and even cooked us Portugese chicken one night. Just ask the day before. A 4x4 outing with the Green Devils and Hugo as guide is a fantastic experience. Rivera Brava is a lovely small town for a browse. A great place to eat and very good food is Borda d'Agua with very friendly staff aswell. Thank you for review. Mr Pizza is great and good value for the pizzas you get. They also have a shop on the site. 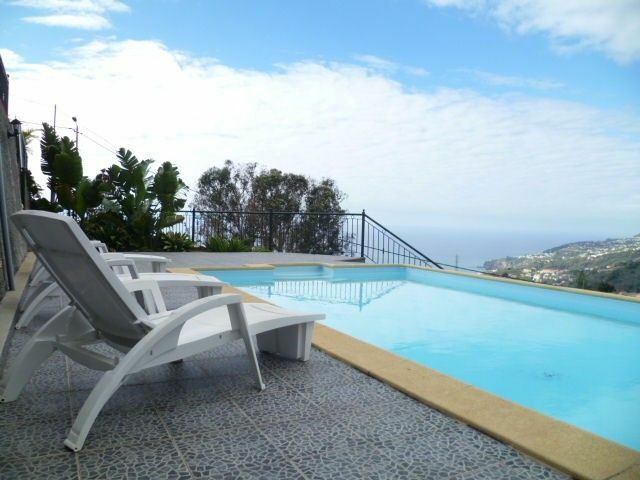 clean and well equipped villa with good views and nice pool but a bit isolated. The villa is well appointed, comfortable and clean inside. Pool was well used, and a decent size and depth for kids. gets sun from 10am for rest of day. Not sure it is heated but was warm enough in august. View is wonderful, but this is a villa that is well outside the urban areas, just down from village of boa morte. Drawback despite the views is feeling a little isolated, but this is perhaps a tradeoff. Lots of dogs around the area, lots of barking, and that included from other buildings just behind the villa which barked every time we walked past, so this may affect some people's decision to stay but not a big issue overall. Ideally a car is necessary but this is expensive at peak times, especially if you need a 7 seater: the cost of this will exceed the cost of the villa itself for a week. There is however a local bus service (rodoeste company, timetable on internet, look for bus from boa morte to riviera brava) from just outside the villa down to the town of riviera brava which is about 4km down the hill; this is not walkable at all, but the bus only takes 15-20 minutes and costs 1.30 euros per adult each way. One has to plan however due to infrequent buses, especially at the weekend, where they are only a few running and only in the morning. Without the bus we would have struggled to stay in this villa. The villa has a decent collection of DVDs and a table football. kitchen is well appointed and there is a fridge with small freezer. For self catering, there is a small but well supplied supermarket (pingo doce) in riviera brava. Very little choice of food in 2 local and rather run down stores attached to bars within walking distance. Day trips are a must, 120-140 euros for the day for a 7-8 seater taxi, cheaper for that number than renting your own car and companies are flexible), and lots to see, really beautiful island, highlights were porto moniz and funchal itself, which is a lovely town. This beautiful villa was perfect for our family holiday with two teenagers. It was very spacious and airy, and very well equipped. The views were breathtaking, I couldn't wait to get up every morning to stare out at the scenery. The villa was spotlessly clean and the beds were very comfortable and the DVD collection came in very handy. Although the weather wasn't blisteringly hot we swam in the pool most days which was very pleasant. We walked up the hill a few times to walk along the Levada do Norte; spectacular through the forest and pretty easy walking. Mr Pizza down the road was adequate, but Muralha Grill down in Ribeira Brava is thoroughly recommended. It's an easy drive to Funchal, the cable car is really good fun, we also drove to Queimadas which was quite a long drive (we'd recommend driving past Funchal for a quicker but less dramatic route)but worth it and you need a car with a powerful engine to get up the hills, particularly the extremely steep driveway to the villa! Stunning villa with amazing views. The pictures on the website do not do justice to this property. It is an amazing villa and very spacious, it has all the amenities that you should expect from a luxury villa. The view from the terraces are spectacular and we never tired of sitting there and looking out across the Atlantic. The local area although remote was beautiful and the local people were so friendly and helpful. We enjoyed a couple of fun nights at Mr Pizza about 300m from the property. We also enjoyed a couple of days out in Ribeira Brava and Funchal, with not hiring a car we were dependent on the local Taxi service which was clean, reliable, value for money and very friendly. A return trip to Funchal was just 52 Euros for 7 people which we booked via the friendly staff at Mr Pizza. A week we will never forget and would not hesitate re booking the same villa if we decide to spend our holiday on the stunning island of Madeira again. Wir waren für eine Woche vor Ort. Das Haus ist sehr sauber, der Pool gepflegt. Die Aussicht faszinierend.Vor Ort hat uns Rosalia herzlich empfangen und alles ausführlich gezeigt. Das Haus ist mit allem ausgestattet, was man sich wünscht (Abwaschmaschine, Waschmaschine, Tumbler etc.) Die Zufahrt zum Haus ist etwas mühsam, eine sehr steile Strasse führt hinauf, ein etwas kleineres Mietauto wie wir hatten (Kompaktkombi), wäre durchaus von Vorteil. Jedoch muss die Motorenleistung genügend sein, sonst kommt man nicht hoch. Located in calm and pleasant area near the town of Ribeira Brava, Madeira, it has all the amenities you need, Ribeira Brava is only 5 mins from the villa and has many local cafes, bars, restaurants, supermarkets, bank/cash machines, shopping (modern shopping complexes or stroll around little shops) and a sports centre. Ribeira Brava also hosts a protected swimming area, swimming platform, splash pool, sun terraces and boardwalk. Its central position is also ideally suited to explore the whole island. The villa is on a bus route, the island has a good bus and taxi service. Golf: There are two golf courses on the island. Even if you are not interested in golf they are worth a visit to see how they have been fitted into the mountains of Madeira. Both offer golf training courses. These are 35 mins away. The Madeira open is played on this golf course in Feb - Mar. Santa da Sierra is a dramatically sited golf course approx. 1.5 km from the village of Santo Antonio da Serra on the far Eastern side of the island.The club house provides fantastic views over the Desertas Islands and towards the eastern tip of the island of Madeira.